MainAll NewsDefense/Middle EastJapanese Oil Tanker Attacked? 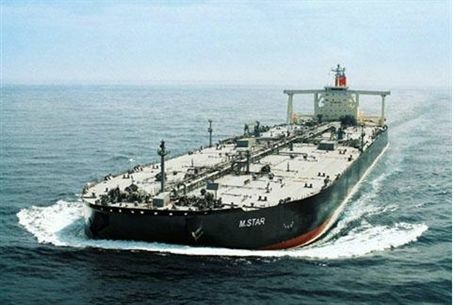 A suspicious explosion aboard the “M Star” Japanese oil tanker in the Strait of Hormuz is under investigation by Mitsui OSK, US and UK officials. A suspicious explosion aboard the “M Star” Japanese oil tanker in the Strait of Hormuz has led Mitsui OSK company officials to believe that its vessel was attacked. The blast occurred about 5:30 A.M. local time, officials said. Japan's Ministry of Land, Infrastructure, Transport and Tourism said one person was injured in Wednesday's blast. The tanker suffered hull damage “caused by an explosion which seemed to be an attack from external sources,” according to a statement posted on the company's web site. There were no reports of oil leaking from the tanker, which arrived late Wednesday under its own steam at the port at Fujairah in the United Arab Emirates. Inspections are being carried out by the company, and by officers from the U.S. Navy and Britain's Maritime Trade Operations. Opponents of an Israeli or U.S. attack on Iran have warned that such an attack would lead to the closing of the Straits of Hormuz to oil tankers, leading to a global economic crisis. Masahiko Hibino, head of the company's safety management division, said the weather at the time was calm and there were no reports of high waves in the region. “There are some reports saying the tanker was hit by strong waves, but it's quite unlikely. We have not reached a conclusion, but we still suspect” the tanker was attacked,” he said. Hibino did not indicate who the company thought might have been behind the blast. Photos taken of the outside of the vessel – published by the WAM news agency – showed an indentation several meters across in the hull, although no obvious signs of explosion such as a burn mark. Photos displayed at the news conference showed broken furniture and fittings, shattered glass inside a dry cabin, a shattered window, damage to the railings and the loss of a life vessel. Captain Musa Murad, head of UAE's Port of Fujairah, claimed late Wednesday that an earthquake was responsible for the blast. Murad told the state-run Emirates News Agency that the tanker was hit by a high wave as the result of a temblor shock as it was passing through the strait. A seismologist in Iran said there had been a 3.4-magnitude earthquake in Bandar Abbas. However, the U.S. Geological Survey's global earthquake database shows that the last earthquake to hit the region occurred last Saturday near the coast of southern Iran, reaching 4.8 on the Richter scale. The tanker was carrying 31 crew members, 16 from the Philippines and 15 from India and 270,000 tons of oil. It was traveling from the United Arab Emirates to the Chiba port near Tokyo, Japan at the time of the incident. Middle East crude comprises approximately 90 percent of Japan's total imports, according to the Khaleej Times. Some 40 percent of the world's traded oil passes through the Strait of Hormuz, a busy maritime trade lane that links the ports of Saudi Arabia, Kuwait and other oil-rich nations with their global export markets. The waterway, less than 100 kilometers (60 miles) across at its widest point, separates Oman from Iran, and is the gateway to the Persian Gulf.